(WACO) – James Floyd is soaring not only in his studies at Texas State Technical College, but also in receiving a financial boost. Floyd was one of two college students nationwide to recently receive a $2,000 scholarship from Mesa Airlines and the international coed aviation fraternity Alpha Eta Rho. Floyd is president of the Alpha Eta Rho’s Alpha Pi Chapter based at TSTC. Floyd is scheduled to graduate in 2019 with an Associate of Applied Science degree in Avionics Technology. This will be his fourth associate degree from TSTC. “I wanted to expand my knowledge to work on any part of the aircraft,” said Floyd. Floyd grew up in Round Rock and graduated from homeschooling in 2003. He was in the U.S. Air Force from 2004 to 2010 and left the service as a senior airman. He did three deployments in Afghanistan and Iraq and a support deployment to the United Arab Emirates. “I wanted to serve my country to do my part to ensure our U.S. Constitution is upheld,” said Floyd. After the military, he worked for an armored courier service but realized he needed other skills to ensure his success. In 2014, he enrolled at TSTC in Williamson County and graduated two years later with an Associate of Applied Science degree in Welding Technology. He said he enjoyed precision tungsten inert gas, or TIG, welding and learn it can be used in the aviation field. In fall 2016, he transferred to TSTC in Waco and began studying aviation maintenance. Floyd finished associate degrees in Aircraft Airframe Technology and Aircraft Powerplant Technology earlier this year. 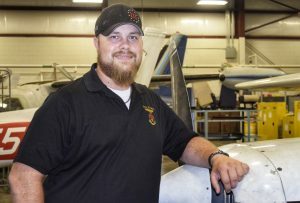 Martin Seagraves, the lead instructor in TSTC’s Avionics Technology department, said graduates having the Aircraft Airframe Technology, Aircraft Powerplant Technology and Avionics Technology degrees means they can fix anything on an aircraft. Registration for fall classes is ongoing through the end of the month. This entry was posted in Waco on August 10, 2018 by Daniel Perry.